Today is an exciting day on this blog: It’s the day I can finally share a column I’ve been looking forward to for months now! And not only me, it’s an idea I’ve been working on with one of my favourite bloggers and dear friend: Latrina from Of Trees and Hues. Let me explain how our new idea was born: Writing back and forth between Germany and the US (Trina is from Sacramento) one thing we often talked about was how different so many things take place in Germany and California even though our cultures are relatively similar. I think it’s super-interesting to learn something new about the other ones culture and lifestyle (I guess you can see that I’m studying Sociology ;). One day then, we had the idea: If we find this interesting, you will, too, so why not we share it with you all? And maybe learn something about you on the way as well? Well, why don’t we get started! 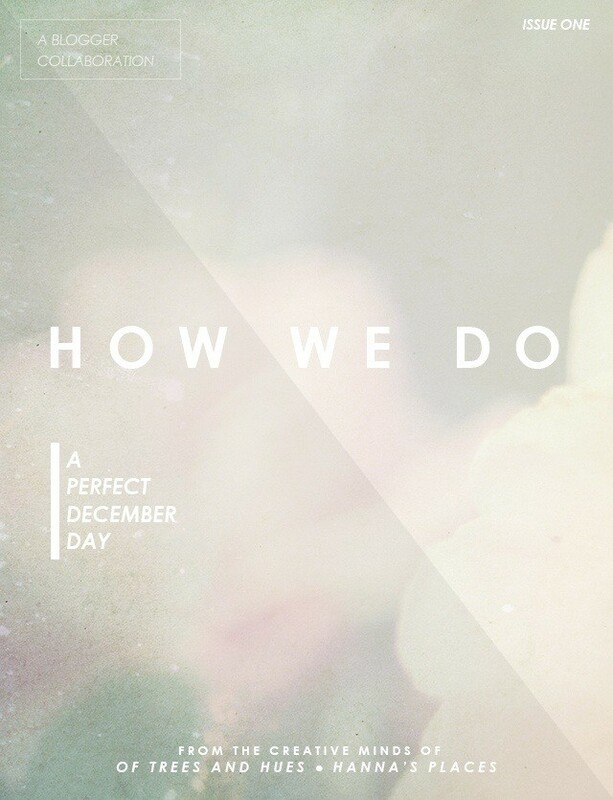 Our first topic is one of my favourite topics of all time: What does the perfect day in December look? Hanna writes: I’ve loved Christmas and the days leading up to Christmas ever since I was a little child. I don’t really understand what’s not to like about it – it’s the season of love and forgiving and remembering what Jesus did for us on the cross. It’s a time to treasure everything and everyone you’re blessed with. The days leading up to Christmas should reflect that. When Latrina and I started dreaming about this column, I have looked forward to writing about the perfect December day from the beginning. What time is better to just take a step back and just enjoy your time? So, for me it starts with sleeping in and staying in bed a little bit longer to read one of my favourite novels (I think December is the perfect time to read Dickens, what about you?). After a few chapters, a long and leisurely breakfast is to be had, because every perfect day has to start with a long breakfast in my opinion. Since it’s the perfect day, it would have snowed overnight and the world outside will look peaceful and quiet. I would be with my family and we would drink hot cinnamon tea, eat hazelnut rolls fresh from the oven and stay seated around the breakfast table as long as possible, talking and dreaming. After breakfast, my little brother and I would get out the cookie cutters and make a few batches of Christmas cookies using my grandma’s favourite recipe. While they are in the oven and the house starts smelling heavenly, we will get out some board games and just let the hours slip away. Even though it’s so cozy inside, sometime in the afternoon it’s time to get dressed and head outside for a walk in the fresh snow, maybe go sledding as well (or build a snowman). As it’s beginning to get darker, a few friends and I would meet up at the Christmas market where we can stay warm with some mulled wine and the wonderful food that’s sold there (my favourite are Dampfnudeln – yeast dumplings filled with plum jam – or roasted chestnuts). I’m no good at it, but some ice skating has to be part of the trip to the Christmas market as well. Before it’s getting too late, we’ll walk back home through the snow, cold from the outside but warm on the inside. The day will end with some hot chocolate, some knitting and one of my all-time favourite Christmas movies – Love, Actually. I already can’t wait for a day like that. That’s what I would love to spend today, tomorrow and probably every day until December. Trina writes: I anxiously await the month of December all year long. As a child, it was probably my favorite time of the year — and honestly, it still is. The weather is at its coolest, the air smells of burning fireplaces, and homes are full of laughter and cheer. I can’t help but be happy when December rolls around. The perfect December day, for me, consists of waking up to a warm house full of holiday decor. I’d start my morning off with a cup of coffee and either pancakes or fruit parfait — or both! Followed by lounging around the house watching classic holiday cartoons. You know… the real old ones, created way before we were even born. I love those! The afternoons would be spent either holiday shopping, wrapping gifts (which I love!) or spending time with loved ones. December, to me, is also a month of thankfulness and joy so I like to keep a happy home to reflect that. Yummy scented candles, low lights, instrumental music filling the air, and lots of story-telling & reminiscing. Head on over to her blog to read the rest of the story. Next month is getting even better: We’ll be dreaming about our perfect Sunday morning. . And not only us, but you can, too! It would be amazing, if there would be bloggers from all over the world joining in on the fun. Just let us know and send us your words, so we can introduce you a little as well!